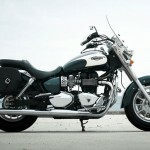 New documents released by the California Air Resources Board reveal the existence of a new model from Triumph to be called the America Horizon for the 2014 model year. 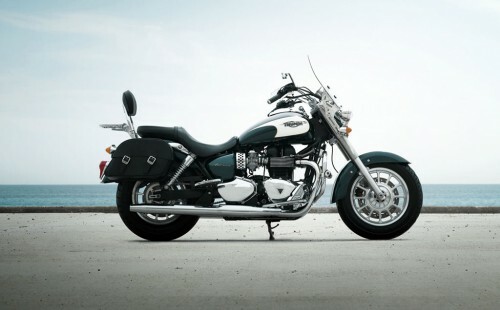 As its name implies, the 2014 Triumph America Horizon will likely be based on the existing Triumph America (the 2012 America is pictured above with touring accessories as an illustration.) 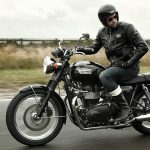 The CARB documents confirm it will use the same 865cc parallel-Twin engine as the America as well as the Bonneville, Scrambler, Thruxton and the Speedmaster. 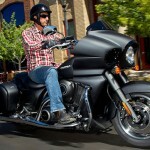 We predict a claimed output of 60hp at 6800rpm and 53 ft-lb. at 3300 rpm as found on the Triumph America. 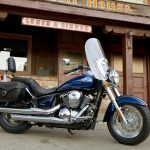 The documents reveal little other details about the new Triumph America Horizon though we can make some conjectures based on how it will likely fit into Triumph’s lineup. The name Horizon would suggest a touring version of the America. 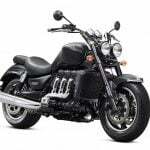 At the moment, the 2294cc Rocket III is the only touring cruiser in Triumph’s lineup leaving a gap in the mid-sized touring model. Triumph currently offers a choice of touring accessories for the America, but we expect the 2014 Triumph America Horizon would come standard with panniers, windscreen and perhaps a passenger backrest. 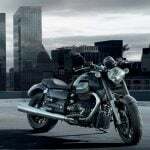 We’ll have more details when Triumph releases official information about the 2014 America Horizon.